In keeping with our “tour of history” for the Spring Alabama Repertory Dance Theatre concert featuring Limon’s “There is a Time”, I chose to create a work inspired by Trisha Brown and the post-modern dance era. I continue to find the various methods of choreography experimented with during the 60s and 70s relevant to my work today, even though the aesthetic has certainly changed. The diverse methods of process have always been inspiring to me and I continue to experiment with different ways to generate movement and put it together. The concept for this work was to play with retrograde and mathematical patterns. The dance is a mirror image of itself, first playing backwards (with Johnny Cash singing “Walk the Line” backwards as well) and then forward. 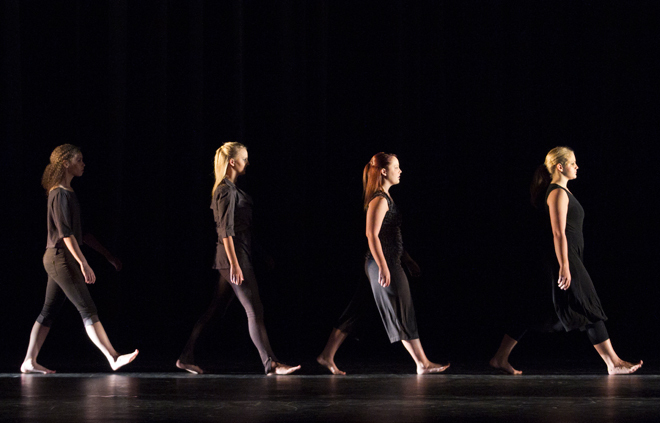 The movement is centered on different ways to travel (walk, crawl, slide, roll) in a straight line across the stage. It was a very different process for the dancers as we learned each phrase and then immediately had to figure out how to do it in reverse. The dance was thus built from the middle, outward. I could sense a lot of frustration in the rehearsal process as I was challenging the dancers more intellectually than physically, but eventually it all started to click and everyone was mastering the movement in both directions. I know I was able to push myself as a choreographer in a new way with this piece as well as engage the dancers’ whole selves in a physical/intellectual/emotional capacity.